This piece was originally published by Seattle Transit Blog on July 21, 2018. The fate of the Center City Connector (CCC) is still undecided, but Mayor Jenny Durkan may have tipped her hand towards canceling the project. A release sent out by Durkan’s office last week explained why the mayor’s decision has been delayed. An analysis of the project by consulting firm KPMG has yet to be completed, despite an initial deadline for delivery in late June. The release follows a similarly skeptical note written by Councilmember Lisa Herbold, a longtime CCC critic, in her weekly constituent letter. 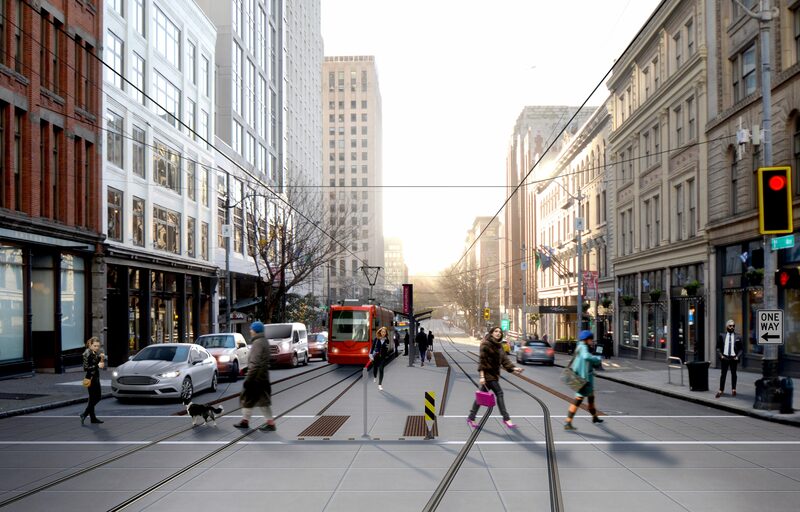 The release raised several critiques of the streetcar project, most notably about the size and operability of the tram vehicles that SDOT intends to procure for the project. A low floor tram in service in Helsinki. Credit: LHOON. However, the size of the vehicles is easily explained: they’re low floor vehicles designed to help people with disabilities load. That feature makes vehicles them inherently heavier than the vehicles currently on the streetcar network; the vehicles are increasingly common rolling stock for tram systems across the world. The release also raises the question of whether the vehicles have the correct gauge. As best as anyone can tell from the contracts SDOT executed for the vehicles, the vehicles should fit the track. SDOT’s Director of Transit and Mobility, Andrew Glass Hastings, declined to comment on the mayor’s concerns. Downtown groups who supported the mayor during her election campaign, like the Downtown Seattle Association and Alliance for Pioneer Square, are growing increasingly restive over the delayed project. Transit and streetcar advocates have said that the concerns raised in the release are overblown. They argue that the questions about vehicle size are routine concerns that are typically addressed in the engineering phase of construction, and that the mayor is essentially engaging in concern trolling. “A connected streetcar network remains a critical investment for our center city—which in the last year alone absorbed 20% of all business district development in the United States and continues to absorb the lion’s share of Seattle’s new residents,” said Don Blakeney, the Downtown Seattle Association’s VP of advocacy. Copyright 2019 Downtown Seattle Association. All Rights Reserved.